As we left town we started to get into some rolling hills that were steeper than what we’d seen so far. If you look at the profile for the day, you can see the sawtooth pattern of these hills that we kept riding all day. Eric and I were riding together and going pretty quickly up and down the hills. After a few reps my breakfast started to rebel against me and I had to slow down. I waved Eric past and told him I wasn’t going to be able to keep up that pace and he should go on. Afterwards Eric pointed out how dumb it was for the guy who was in front, and setting the pace, to say that. But he did go by and for the rest of the day I would be riding by myself. In truth, other than the rolling hills and the distance, there’s not much that I remember about riding that day. 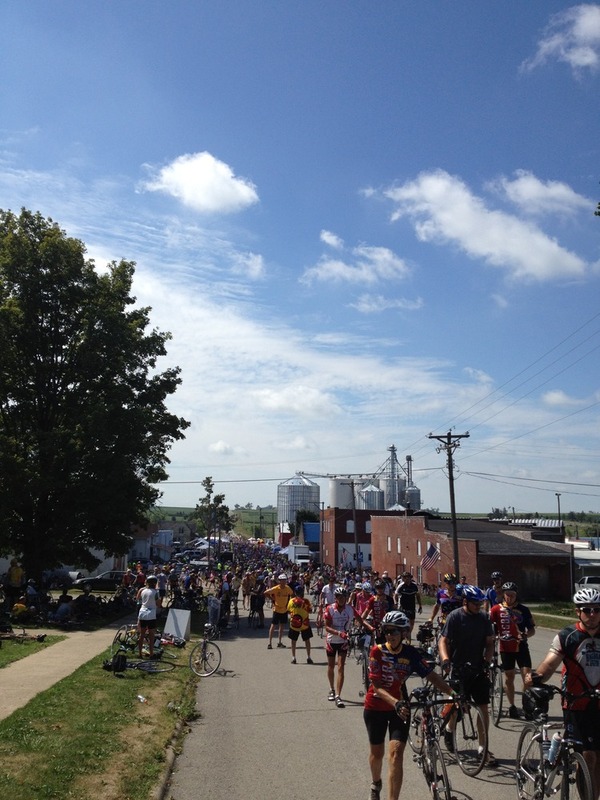 The RAGBRAI route summary can tell you more about what things were like on the ride than I can. I rode pretty quickly, picking up pacelines when I could. I stopped in Clutier, a town with just over 200 people, for something to drink and to pick up some cash from the ATM. They had a small little petting zoo, with a few animals you could hold, including a piglet, and a small calf that was a really pretty animal. I ran into Bill heading out of town and he told me he was going to call Ross and ride in the van to Cedar Rapids. The day was still warm, but not nearly as hot as it had been. The steep rolling hills were annoying, kind of like riding intervals for hours, but I managed and kept on going. Since I was by myself I’d strike up conversations with the riders around me. Our ride packets had included placards we could write our name, team name, hometown, and number of RAGBRAIs on, with our emergency contact information on the back. Many of us mounted these on the back of our bikes and they were handy in getting conversations started. But it was still kind of shocking to have a stranger ride by and call you by name, and I enjoyed doing that to people during the day. Whenever I could I would ride up to the kids on the route, whether they were riding their own bike or being pulled along by a parent, and cheer them on. There was one family with a toddler in a trailer and a kindergartener on a tandem. I dubbed them “Awesome” and “Awesomer” and would call out to them whenever I saw them and would get big smiles back. I stopped for food in Shellsburg and got a seat in the shade behind the beer garden. They had big tubs of beer on ice and after I finished my food they said they didn’t care if I dipped my arms in them to cool off, but they did draw the line at my actually crawling into one. 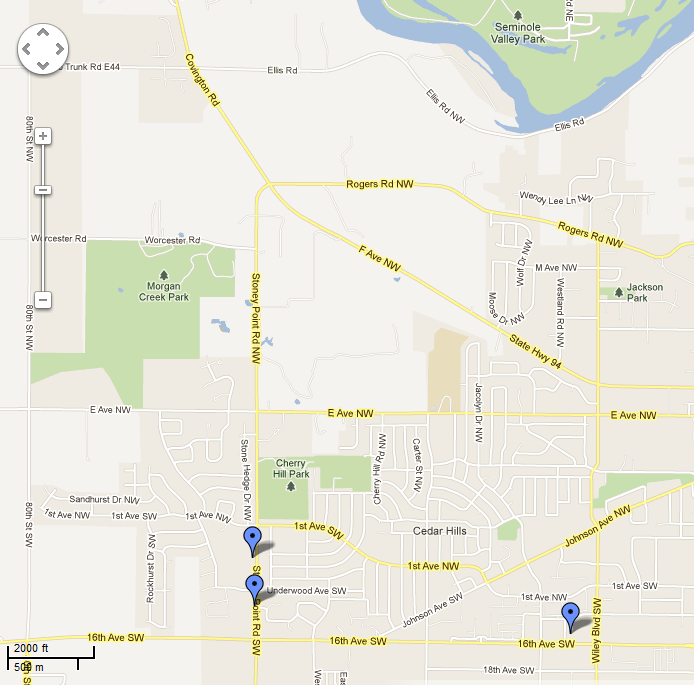 The first few towns were pretty far apart, but the last few were only 4-6 miles apart. After having long rides from the last pass-through town to the overnight town for the previous few days this was kind of nice. The riders who’d been on the ride before thought that having long rides at the end may have been an effort by the organizers to curb drunk riding. When the last town is close to the overnight town it would be common for people to really get the party started early and then weave their way to the overnight. I rode with two guys for most of the final leg and we were moving along pretty nicely. Maybe too nicely because I ended up missing the turn for the road where our campsite was. The plus side was I got to enjoy a really nice ride along the Iowa River on Ellis Road toward downtown. It was really beautiful and so I really didn’t mind when I got to the first information booth and was told I had to go another six miles, mostly uphill, to get to our campsite. After having ridden as many miles as we’d done this week having to ride longer was no longer an issue. So my 84 mile day turned out to actually be 92 by the time I rolled into our campsite to find George taking a nap under a tree. We were camping along a busy street in the front yard of Jarvis Property Restoration (If you’ve got mold or water damage, call Jarvis!). As this photo shows, they had a pretty nice yard and a big tree, but it wasn’t an ideal camping spot. The people there, especially the manager and Emily, the office manager, could not have been more helpful or excited to have us though. They’d ordered two kybo’s for us so we’d have bathrooms handy and they’d also gotten us all-access passes to the YMCA just down the block. 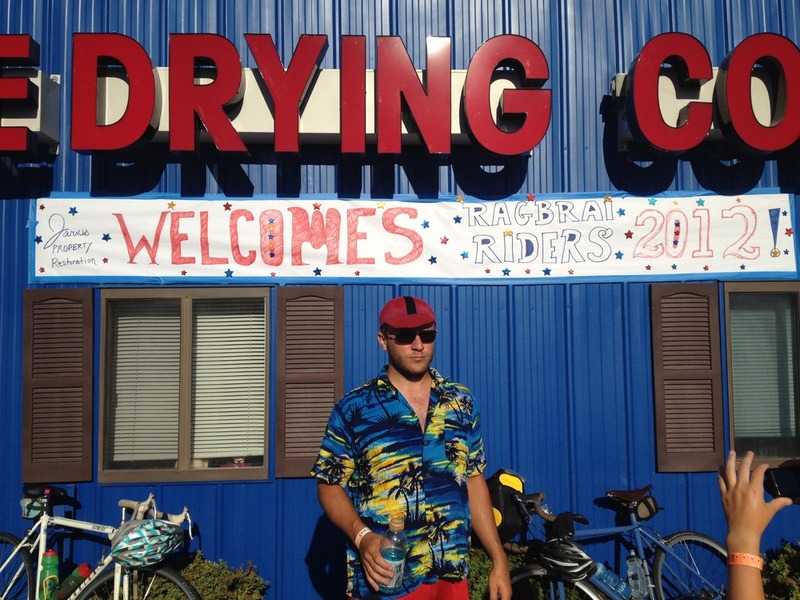 They had put up a big, hand-painted sign, “Welcome RAGBRAI Riders!”, on the front of the building and had a big supply of drinks and snacks (usually intended for their clients, Emily confided) for us. They also had some Jarvis-branded lip balm, blinking lights, and mints. While the manager was all smiles and handshakes and barely contained civic pride, Emily seemed to be laboring under the notion that 1-in-10 RAGBRAI riders were serial killers. She was extremely helpful, but would also slowly back away from you while you were talking to her as if you might stab her at any moment. George and I waited a long time resting under the tree for the rest of our team, or just the van, to arrive. Finally Eric and Bill rode up on their bikes with exciting news – Eric had gotten into town early, stopped for free pie at a house down the street, and had sweet-talked the homeowner into letting us camp there! Half the team had already set up their tents and taken showers, so we should pack up and join them. Then they saw the hand-painted sign, the cooler full of drinks, the rented Kybo’s, and the free lip balm. And they saw George going apoplectic. There was no way, George said, that we could possibly leave this place after everything that they’d done to make us welcome. Eric, to his credit, immediately grasped the issues at hand and as I lay on the grass I could watch the struggle play out in his face between the two options. I didn’t really care where we stayed, either in the nicer campsite at the house or with the nice people at the office building, but as a practical matter I was leaning toward the nicer campsite. So I told Eric that if we were going to move, he was going to have to go inside and explain the situation to Emily, return the YMCA passes they’d gotten us, and apologize for the inconvenience on behalf of the team. Eric went inside to do just that, followed by George. Bill and I waited outside for a few minutes until Eric came back out and announced that we’d be staying put. George had threatened to get on a bus home rather than leave and Eric ended up being as scared of upsetting Emily as much as Emily was scared of us (I’m not exaggerating about that, her mannerisms with us were really this weird contrast of helpful and terrified). So he and Bill rode back to the house down the road, explained what needed to happen to the other team members, and they packed up the van and came to join us. By the time everyone got to camp we’d all agreed we’d done the right thing, even as cars whizzed by us on the street. After getting camp set up several of us, who hadn’t gotten a shower at the house we’d briefly taken over, walked down to the YMCA to swim in their pool and shower in their locker rooms. Others went a bit further down to a water park that was filled with riders. The Y pool, and hot tub, was the perfect way to end the day and those of us who went floated and tread water for a long time before hitting the showers (and doing some laundry with our riding gear at the same time). Afterwards we unhitched the trailer and took the van down the street to find something to eat. We passed a place called “Thai Moon” and I absent-mindedly said the name out loud as it struck me kind of funny. Next thing I knew we were pulling into the parking lot. We enjoyed another meal as a group and also watching thle waitress run, literally, around the restaurant to try to keep up with the surprising influx of hungry riders. Turns out they don’t get much traffic beyond a small group of regulars so having 30 new faces in the place stressed the system out. Since the next day was a short day we sat out under the stars and made a significant dent in our beer and whiskey supply. I’d brought a few cigars and those were enjoyed as well, although not so much the day after. With the front past the evening was really nice and we had a good time talking until well after midnight. Eric and I made an improvement to the campground by turning off the signs which stretched across the front of the building, casting an eerie, and unwelcome, red glow over the yard. To do so I had to hoist Eric up along the side of the building, eight times, and hold him up while he flipped a small switch on the side of each sign. Slightly drunk, this was not too much of a problem and way funnier than it probably would have been otherwise. Waking up to turn them on again, hungover, before dawn, and hopefully before anyone from the company showed up for breakfast, was much less fun. Despite the slight hangover, after a cool night I woke up kind of chilled and for that, after sweating pretty much non-stop for the week, I was thankful.